I am in a happy place today even if a lot of things tried to put me off my mood, today is one of those days when I feel that only something absolutely awful could put me off. The day started early and quite sleepy, with cold and thick fog all over the city but damn, how I love the fog. I wanted so badly to grab my camera at 7am and go around taking photos but I had no time, I was running for my first day of college, second semester to be more exact so I had other priorities. I started a new subject and it makes me so excited because it combines photography and video, this one besides my photography classes tomorrow which is making me go insane with the idea of having like eight hours a week in classes that I love, doing something that I am passionate about. I already knew the teacher but he is still quite inspirational and leaves us wanting more and more which is all kinds of both amazing and frustrating because we have to wait a whole week. We are building up a pinhole, right next Monday, one or more per student, we are going to play with it, we are going into the photography lab and this is making me utterly happy for too many obvious reasons. Then my lip cracked, the lens of my left eye popped out and even thought all of that happened and I had to come home before Aesthetics class I still felt great. The sun was warm, like Spring is really coming, and I skipped lunched and slept for four hours straight, no interruption and I woke up feeling so energized. 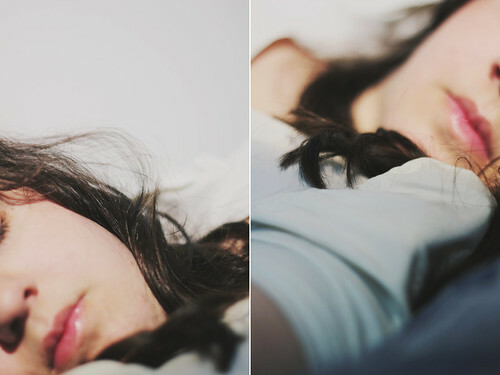 Of course that before that I snapped pictures with no concept, using only a very sleepy me and a very messy hair but I like this photo, maybe the light and all, and I couldn’t choose one from those two so I made a diptych and I think it works well, at least for me it does and I would not have done it any other way.